Are there any pre war photos of people getting lifts? Is there one of Rosemeyer giving his wife a ride in his auto-Union? These were separate incidents. Elly drove her two laps of Monza during practice for the 1936 Italian GP, and squeezed herself alongside Bernd to go round the Nürburgring during an Auto Union filming session immediately after the 1937 Eifelrennen. I don't recall ever having seen a photo of this. 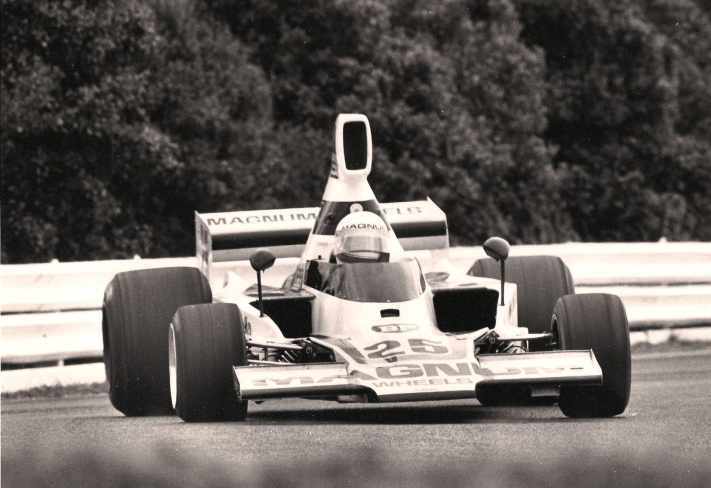 Bob Jane driving the winning Mclaren .Hope John did not suffer from hayfever in those days. always looked great that car. Edited by eldougo, 08 February 2012 - 07:56. Use this link to see 7 people in Bob Jane Jaguar "Getting A Lift ".Anybody know who the man with his legs hanging close to the front wheel. Edited by eldougo, 08 February 2012 - 08:11. Colin Chapman , an extremley passionate designer who was pepared to do anything to add-lightness......apart from walk! That looks bloody precarious. Surely Tiff could have squeezed inside somewhere? 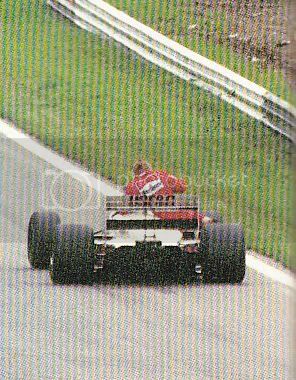 Either Eddie Cheever or Derek Warwick gave a lift to Stefan Johansson after his scary accident with a deer at the 1987 Austrian Grand Prix during a practice session. I got a scan of an Italian magazine somewhere. That would be good if you can find it. Can you imagine that happening these days? Good grief they would have to spend a couple of hours being observed by the medical team! Soooooo true and then have a stewards enquiry plus HUGH fine to the drivers and team. More money to the FIA. Here is the scan of the Johansson lift with one of the Arrows at the last Osterrreichring F1 race. I wonder if USF&G Insurance would have payup if he fell off on the way back "Getting a Lift". Thanks Bigears for the above photo. Edited by eldougo, 27 June 2012 - 10:59. Getting a lift 2012 style , Photo thanks to Joest Racing leMans 2012. Found a couple more getting a lift. Edited by eldougo, 30 May 2013 - 09:41. Thanks Graham that would be the oldest"Getting a Lift". 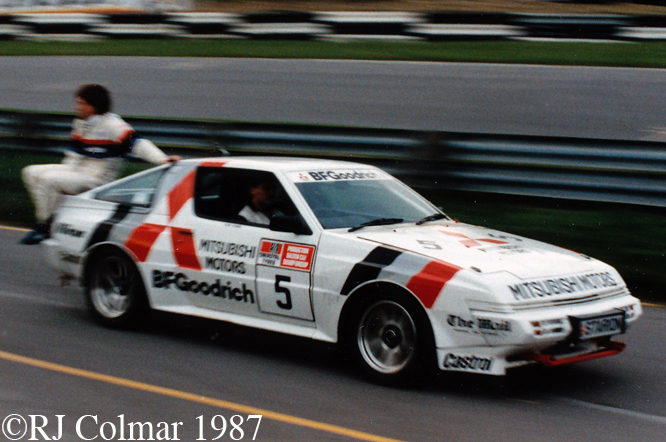 We didn't ever post a photo here of Martin Sampson on the side of John Walker's Lola, did we? 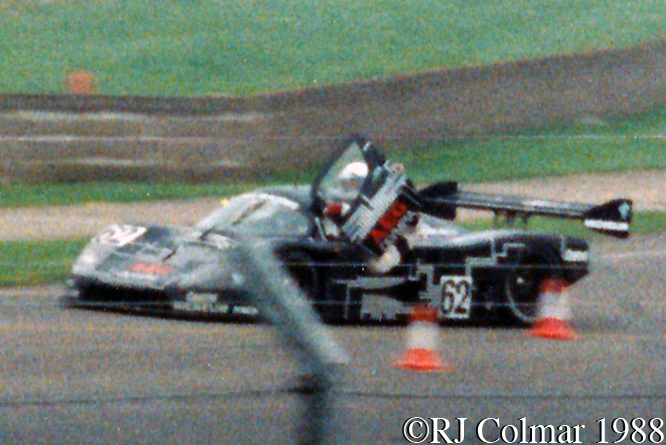 Or should I say, Martin Sampson on his Lola as driven by John Walker? No i just had a look not posted YET do you have one Ray? John Walker and I had an arrangement that we would keep racing together until we won the 'Gold Star'. We achieved this in 1979 - with the AGP for a bonus - and then left the sport. .....As I was loading the car into the truck, I noticed a crack aroud the point where the ferrule which connects the rose joint from the upright is welded into the wishbone. It was the lower right wishbone. We were all gobsmacked! It was only just holding together, cracked almost 100% of the way around the wishbone. What was a fairy tale engine could have been very different. So Martin was actually sitting on a time bomb as he did his one and only lap! Edited by Ray Bell, 03 June 2013 - 08:54. This is Pedro Rodriguez. He's just won the Canadian Grand Prix(then for sportscars)at Mosport in 1963 and has picked up a couple of hitchhikers along the way. Not a clue whom they might be. Anyone? Now there is an opportunity for Speedway, solos with passengers. Though they would have to rename them. That is a great pic of John at full noise. A classic 5000 pic. I had never heard that story about the wishbone. Maybe it is just as well that Martin is sitting on the left side of the car! 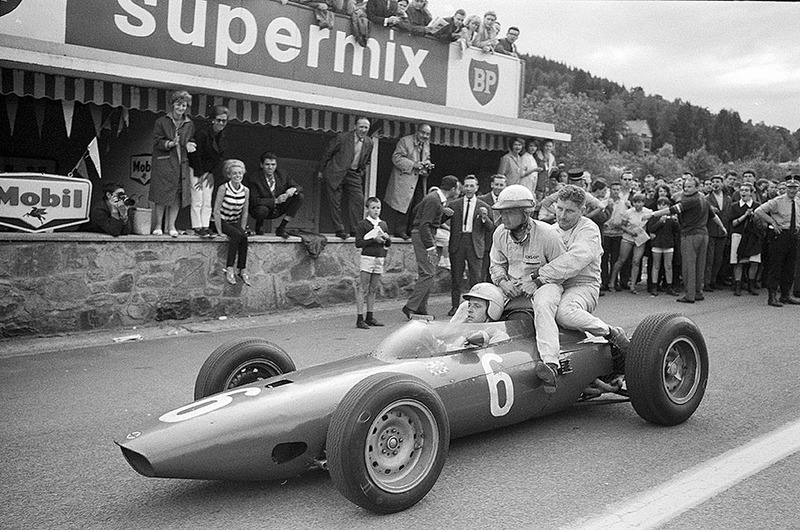 1965 SPA,P. Hill & A Pilette ??? Great photo Graham it is some thing we will never see again with todays cars, and Lee it good when a few more pop up that must have been late 70.s at Sandown i guess..
Edited by eldougo, 09 August 2013 - 00:36. Permission from Brian Watson to use his photos. Jack and very Young Gary Brabham(changed) at after the win at Oulton Park 1967.(changed). Unknown driver" Getting a Lift" at Kyalami 1971 on the back of John Nicholson McLarenF5000 . Edited by eldougo, 12 August 2013 - 09:03. Jack and very Young Geoff Brabham at after the win at Oulton Park 1971. And I'd think, seeing as Geoffrey was at least 17 and racing in 1973, this might actually be one of the younger boys. It’s actually the Oulton Park Spring Cup run in April 1967 and the passenger is Gary (at this time Geoff was fifteen and David around eighteen months). 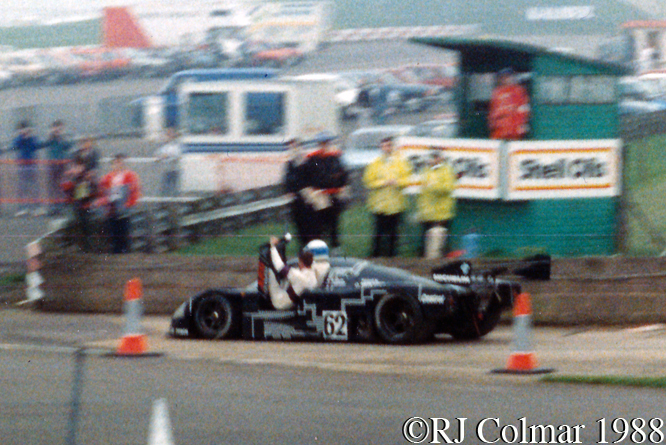 There’s another photo showing Gary in the car in the Brabham/Nye book. This was, I believe, the first race where the Repco F1 engine ran in ‘640’ form using the revised cylinder heads with the exhausts in the centre of the vee. It's a Repco with the centre exhausts, which is an immediate giveaway for '67 or maybe '68. Unknown driver" Getting a Lift" at Kyalami 1971 on the back of John Nicholson McLaren F5000 . Is it just me or does Brabham Jr. look distinctly unhappy!? I think you're right. In the photo in the Brabham/Nye book (a close-up taken with the car stationary) he looks distinctly underwhelmed by the experience. I have changed it to 1967 (typo error)..
Only going by the details that come with the photo Re F50000 car. So if it is not that driver WHO is it on the back ? Iam waiting for the answer !!!! Graham, is your caption a correction of the original? Either way, it doesn't look like Bob Anderson. I think Eldougo was right back in 2011 with his suggestion of Andre Pilette. Doug, instead of aggressively bombarding us with exclamation marks, perhaps you could try to help with the identification. 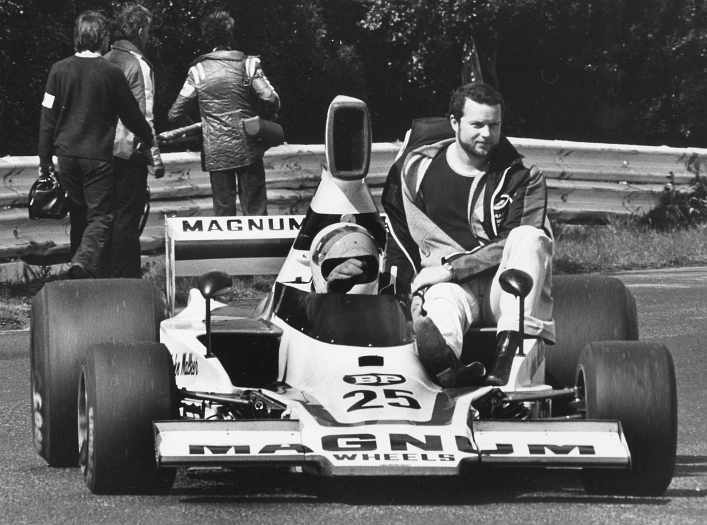 You miscaptioned both of the Brian Watson photos you posted here (and still haven't changed the passenger's name to Gary in the Brabham photo). Brian Watson's caption for the second photo says that it's John McNicol in the 25th Anniversary Trophy at Kyalami in 1971. This race was run on 7th August, and McNicol finished a fine second to Dave Charlton's Lotus 72. The retirements were John Love, Willie Ferguson, Kipp Ackerman, Bob Olthoff and Spencer Schultze, and presumably one of these is the passenger. As you're obviously in touch with Brian, perhaps you could pick his brains about who the passenger might be. Unless the photo was taken during practice, it can't be Anderson as he didn't start the race following engine problems during practice. The details pop up for a few seconds and they do not repeat. I ask Brian for permission not details. i have other things to do. The retirements were John Love, Willie Ferguson, Kipp Ackerman, Bob Olthoff and Spencer Schultze, and presumably one of these is the passenger. I will wait and fill in the blanks when details arrive via the TNF.that is what this forum is for. Maybe you should ask Brian for the details you want to know instead of wasting your obviously oh so precious time with trolling around here. You want to share something here, fine. You have a question then ask and wait until somebody answers. Even if I had the answer to your question, I would keep it for myself because of this a***hole attitude you're showing! If we were in a pub I would show you the door and tell you to leave. People with this attitude are not welcome. Thanks for taking the time to reply to my request re the McLaren photo ,your use of expletives is a waste of productive time in solving the "Getting a Lift" current riddle. Edited by alansart, 22 September 2013 - 17:57. The reprimand was not for the lift but essentially for creating a dangerous situation - and after watching the videos in this thread forums.autosport.com/topic/190057-how-do-you-view-the-alonsowebber-penalty/ I agree with the decision. Edited by scheivlak, 22 September 2013 - 20:38. Not to mention Alonso driving at over 100kph with his passenger, a new record perhaps (?) but absurdly dangerous. IIRC from another thread on this forum, at least one driver (in Brazil?) has died during a pillion lift after falling off at high speed. An F1 race suit is not a MotoGP airbag suit. The way Webber ran out there on the track, the way Alonso pulled up on the line, ridiculous.